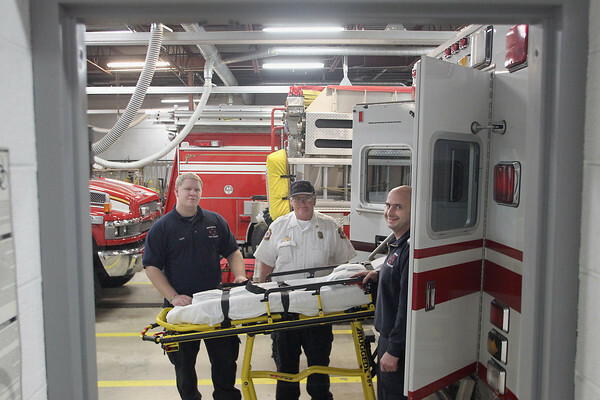 From left, Peninsula Fire Department Firefighter/EMT Cody Lipe (cq), Chief Richard VanderMey (cq) and Assistant Chief Randy Rittenhouse (cq) stand next to one of the station's two ambulances. "Years ago you used to be 80 percent fire and 20 percent medical," said Peninsula Fire Department Chief Richard VanderMey (cq) of emergency calls to the station. "Now we're the opposite." The township may see even more medical calls according to a study that projects the senior population in the Grand Traverse region to double in the next 20 years.